Hey guys! So, you’re probably wondering why I fell off the face of the planet… At least here on the blog anyways. I thought I’d pop in to give y’all a quick update as to what’s been going on. I went for a 5-mile run. See, my mom was keeping Lucas that night, so I figured that I may as well make the most of my free time and get some exercise in. And I reasoned that my back would “loosen up” as I ran. **coughcoughDUMB!!**. About 1/2 mile from the finish I felt these crazy shooting pains down my leg and it was all over from there. No sleep for days. Crazy pain, both in my back and leg. Really, really dumb. I knew better every step of the way. After two weeks of being nearly incapacitated by pain, I finally got checked out… Turns out I have herniated a disc. So, I’ve been unable to do much since then, which has been extremely difficult for me. I’m one of those people who doesn’t stop moving and I’m very self-sufficient, so it’s been challenging/annoying having to constantly ask people to do things for me. And I still haven’t gotten used to “overdoing it” with just simple chores around the house. I’m 34 years old but feel 90 right now. Such a bummer. I’m currently doing physical therapy and just finished a round of oral steroids. The next step is likely an injection if there isn’t decent improvement soon. Ugh. I refuse to consider surgery as a possibility at this point. NO. Just, no. One thing that I can say for sure is that I couldn’t have hurt my back at a worse time. It happened just a few weeks before an amazing benefit that my family organized in memory of my brother, Alex. It was the 1st Annual SSG Alex Viola Memorial Car Show. My brother loved cars and actually rebuilt a 1968 Chevelle with my dad when he was younger. This seemed like the perfect fundraising event to honor him. And it was so, so great. Many of my brothers Green Beret teammates came into town to act as judges of the car show and they awarded these awesome trophies to the winners. We had over 180 cars register and a over twenty others that showed up after registration closed. We’re still waiting on a few things (contributions and expenses) to be finalized before we have an exact number for how much we raised (and can make an official announcement, so consider this unofficial) …. but at this point, we think it’s somewhere in the neighborhood of $20K. These funds will be distributed to the Green Beret Foundation and Special Operations Warrior Foundation once everything is finalized. Not too shabby for our first go at it. We’re already stoked for next year. And we were so incredibly honored by the support that we received from local businesses, car enthusiasts, and the general public. 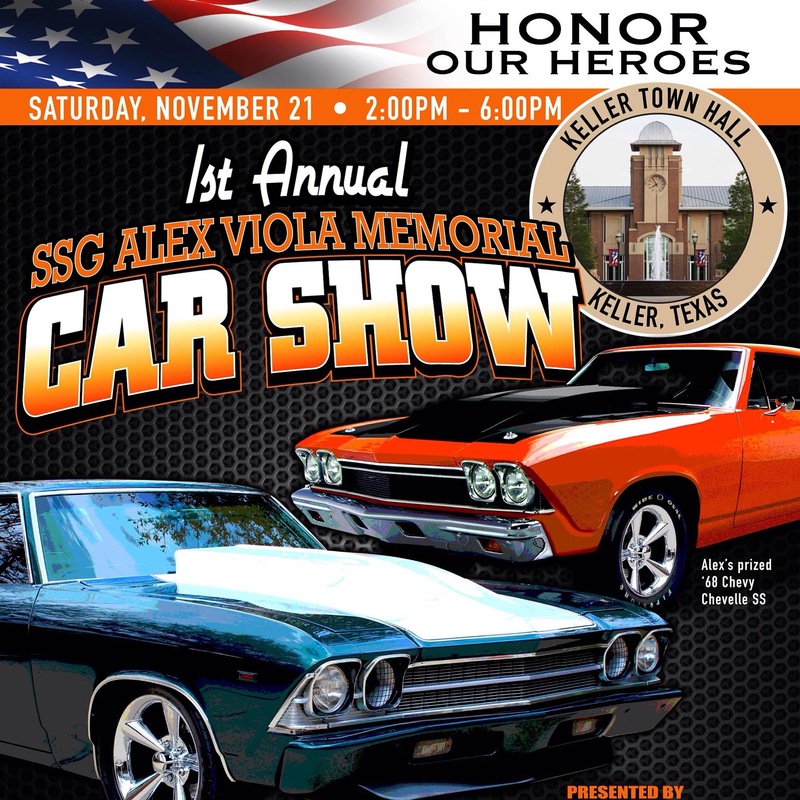 We’ll be posting pictures of the car show on the SSG Alex Viola Foundation website once they’re available, so check back there if you’re interested. After the car show, things haven’t slowed down much. The weekend immediately after was Thanksgiving (fun, family, and a LOT of food) and this coming week we’re hosting a Christmas party for my book club, followed by Lucas’s birthday the next week. All of these things are great fun and stuff we’re totally looking forward to, but it’s definitely busy (and somehow doing it all with a herniated disc makes it seem way busier). Oh, and did I mention that a week after I injured my back our computer finally died?? Like, stick a fork in him. Done. We knew it was a matter of time, but still… We’ve been so busy since then that we haven’t had time to even shop for a new one. So until that happens, I have no way of uploading pics from my camera. Obviously, this has been a huge blogging barrier. Hopefully, soon we’ll have a replacement. Hopefully. Then, there’s the house. I feel like I’m such a downer lately in this area. Don’t get me wrong, we love our home but we’ve had so much go wrong over the past year that it’s become a bit exhausting. I posted this explanation of stuff back a few months ago when I took a “discouragement-induced” break due to the expensive, boring things that have wreaked havoc on our humble abode. 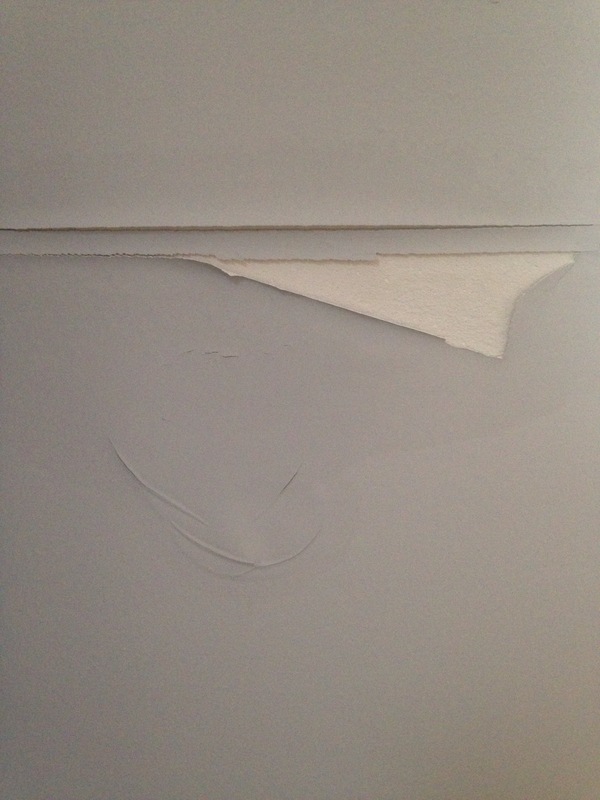 Well, here’s another… Two weeks ago we discovered a roof leak in our dining area which caused this damage (in addition to more, not shown) as well as an influx of water to enter our home through the wall.